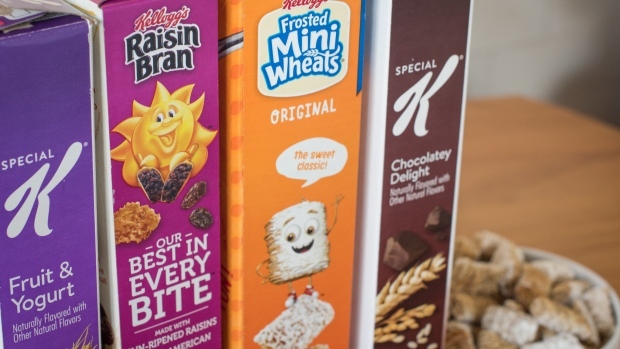 Kellogg Co. is at peace with cereal’s diminished status in America’s pantries, acknowledging that it’s unlikely to undergo a renaissance as consumers branch out to other kinds of breakfast food. In ten years, demand for the company’s signature product “is not going to be dramatically different,” Chief Executive Officer Steve Cahillane said in an interview. He added that cereal, even without dynamic growth, will always have a place in U.S. kitchens. Kellogg isn’t putting its eggs all in one basket, however, and sees other areas -- like its push into single-serve pack formats of products like Pringles and Cheez-Its -- fueling revenue growth. “If cereal’s flat, we can live with that,” he said. Investors may not be able to, however. The shares fell as much as 6.2 per cent on Thursday, in part because the company reported persistent U.S. softness in cereal. U.S. morning foods makes up about 20 per cent of Kellogg’s revenue. Since Cahillane took the reins in 2017, the packaged-food maker has shifted its priority to increasing sales, instead of cutting costs. The decline in cereal’s popularity with Americans has made this goal tougher to achieve. Consumption has waned as the business of breakfast, like on-the-go eating, lower sugar options, and increasing restaurant options, gets more competitive. Cereal demand in the U.S. fell to about US$9 billion in 2018 from US$9.9 billion five years earlier, according to data from Euromonitor. A silver lining is that this trend is reversed on a global scale. Worldwide, cereal sales hit US$24.6 billion last year, up from US$23.2 billion in 2013. There’s even potential for growth, he added. This would be at the opposite ends of the spectrum: the health and wellness side and the “fun, innovative” -- AKA sugary -- side.